Opus & Now Then are proud to present one of the true rising stars of the festival scene with a multi room party at Sheffield's music institution Yellow Arch Studios. 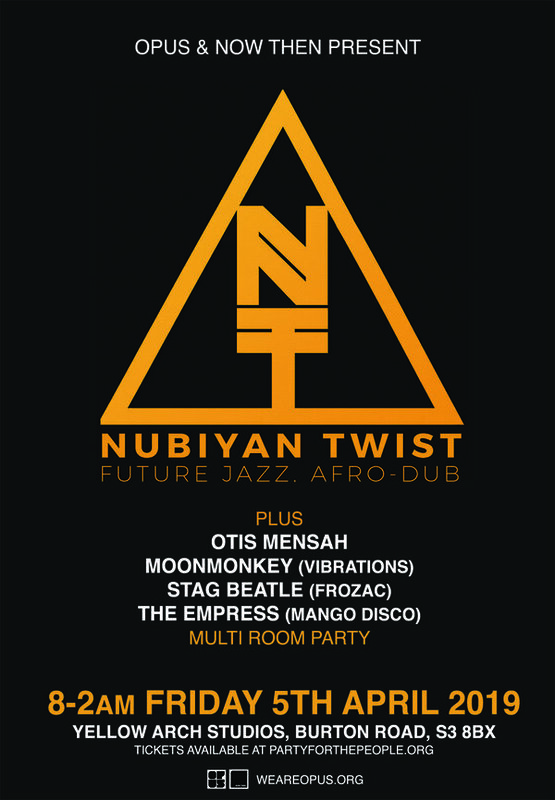 Recently signed to Stut records (think Seun Kuti, Ebo Talyor and Sun Ra), Nubiyan Twist’s new label mates speak volumes of the quality you can expect from their 10 piece live shows. Effortlessly blending Future Jazz, afro beats, heavy dubs and blistering musicianship into their own sound is no easy feat. Sheffield's HipHop sensation is official poet laureate, a young story-teller-rapper-poet with a mesmerising delivery and a talent for drawing the poetic from the everyday happenings in his life. Plus very special guests performers and residents from some of of the best party series across Sheffield! Vibrations resident and longtime Sheffield party promoter, Moonmonkey will be delivering a hefty portion of dancefloor mayhem. Expect copious quantities of speaker juddering bass and beats and a generous sprinkling of the unexpected! Spinning anything from crisp techno cuts to big bass lines. Join The Empress in a celebration of Women and Queer musicians from West Africa, Trinidad, Bolivia and Brazil with a set with a live Congas player. Expect a eclectic riot of Latina, Soca, Dancehall, Afro-beat, Hip-Hop and Highlife!